Ka’anapali Golf Courses is excited to announce the ‘kick off’ of the renovated FootGolf layout on Friday, April 12th with FREE access all day to the public to try their skills on the new layout. Tee times can be booked in advance in the pro shop at 808.661.3691 and walk-ins welcome. Ka’anapali Golf Courses is the only facility across the island of Maui to offer a FootGolf Course for residents and visitors alike. Nine and 18 holes of FootGolf is normally available at Ka’anapali after 4:00 p.m. seven days a week starting at $15 to walk and an additional $15 to ride a shared golf cart. A new monthly FootGolf pass is now available for just $79 a month for unlimited daily FootGolf. A special April rate is available for attendees from this Friday’s event. Ka’anapali Golf Courses joined several other Billy Casper Golf-managed courses across America to launch the FootGolf program in 2015 and it has quickly become a popular afternoon activity for all ages and skill levels. Ka’anapali hosts an annual fall FootGolf League, along with occasional weddings, reunions, birthday parties, team building events and other events on the FootGolf course. 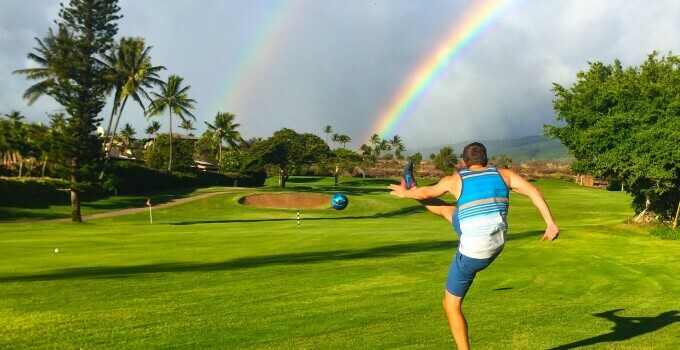 “We love to be able to offer a unique experience to our guests here at Ka’anapali – FootGolf has quickly become a new way for families and non-golfers to experience the golf facility,” stated PGA Director of Golf, Sutee Nitakorn. “We enjoy working with the resort’s hotel sales staff and their corporate meeting planners to offer a great non-golf activity that all of their attendees can participate in. FootGolf is a fun team-building activity and we’ve seen some really unique events here at Ka’anapali as a result, like last year’s charity event for Make-A-Wish Hawaii,” Nitakorn added. In FootGolf, each hole is assigned a “par” and players tee (kick) off using a soccer ball, strategically kicking it from tee to “green”, until they make it in the 21-inch cup. Holes are cut into the rough to protect conditions of fairways and greens, and to avoid affecting everyday golfers. The American FootGolf League provides a rulebook for players to follow. Ka’anapali’s 9-hole loop stretches 1,165 yards and is a par 34. Guests are able to play unlimited FootGolf after 4:00pm on Ka’anapali’s course. To book your FootGolf tee times, please call 808.661.3691 or toll free at 866.454.4653. To inquire about birthday parties, reunions, weddings, team building or other group events, please ask for Sutee Nitakorn or email him at snitakorn@kaanapaligolfcourses.com.